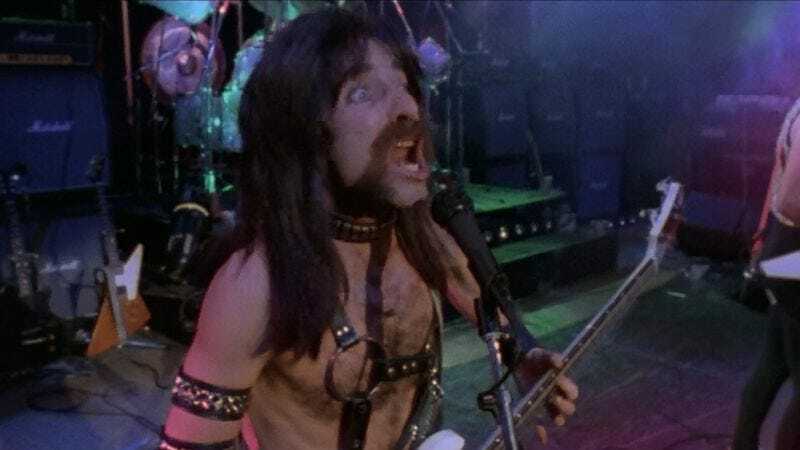 Harry Shearer as Derek Smalls in This Is Spinal Tap. In a video posted to his just-launched website Fairness Rocks, Shearer explains that, while “filing a claim like this one is neither fun nor easy … I think it’s important to challenge the status quo, not just for myself but I hope for all my fellow artists, musicians and creators.” And if the claims he’s alleging are true, they’re certainly justified. After his company discovered the suspicious accounting in 2013, Shearer says Vivendi told him This Is Spinal Tap simply “hasn’t been profitable,” despite it being released twice theatrically, selling untold amounts of VHS and DVD copies, and airing on television—odds are—right now. In addition to somehow generating a mere $81 in profits across the 22-year period from 1984 to 2006, Vivendi—who also owns the label that released the film’s popular soundtrack—also claims that total profits from the album amount to just $98. “Wow. Ninety-eight dollars is about enough to buy one miniature Stonehenge,” Shearer says, alluding to a scene that, if everyone had just paid him a dollar every time it’s been referenced, this lawsuit wouldn’t even be necessary. Sadly it is, and Shearer—who similarly took on The Simpsons last year—is now accusing both companies of fraud, misappropriation, and breach of contract, along with using Spinal Tap profits to offset losses from other, unsuccessful movies. The lawsuit also paints a picture of Vivendi’s generally deceitful practices and overall mismanagement of the Spinal Tap brand, including allowing a beer company to trademark the “Spinal Tap” name unopposed, yet requiring Shearer himself to obtain a license before so much as appearing as the character he created. In addition to $125 million in damages, Shearer is also seeking to have the Vivendi’s copyright to Spinal Tap terminated at its 35-year mark in 2019, though it’s unclear as yet to whom the rights would revert. It also hasn’t been said yet what, if any, involvement this lawsuit will have from Guest, McKean, or director Rob Reiner. What is clear is that, when it comes to media corporation accounting practices, it’s such a fine line between stupid and criminal.